To a young writer, there is no better place to turn for advice than to a much older, more established literary figure. For a young writer, there are fewer books more helpful than A Moveable Feast (although Rilke’s Letters to a Young Poet does spring to mind). This work is as much an homage to Paris as it is a writer’s manifesto. He recounts meeting many of the greatest names of early twentieth-century literature, most remarkably Gertrude Stein, Ezra Pound, and Scott Fitzgerald (not to mention the favorable response to Constance Garnett translations). As well as his own opinions on writing, Hemingway gives insight into the minds of his contemporaries. From this book and some interviews with him, I’ve compiled the top ten pieces of advice Hemingway was fond of giving according to their effectiveness. This is not to supplement engagement with the brilliance of Hemingway, but rather to make those who’ve not read him aware of the hunger they didn’t know existed. Seems simple when you sit down to consider it. By writing in the mornings, you not only make sure that writing does get done, but you’re also placing the habit — symbolically — as the day’s primary force. 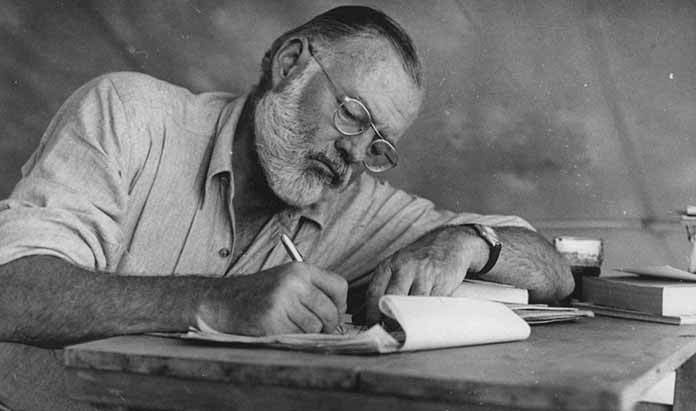 Morning writers are prone to habit, something that is certainly true of our friend Hemingway. He would write from daybreak, listening to the morning birds, until around midday, or until the juice — as he called it — expired and then continue with life. This also allowed plenty of hours to be had with his wife and friends, for reading and hunting, etc. I showed the story to him as a curiosity, as you might show, stupidly, the binnacle of a ship you had just lost in some incredible way, or as you might pick up your booted foot and make some joke about it if it had been amputated after a crash. This tip is particularly evident in Hemingway’s treatment of his interviewers. Annoyance would take over and override his manners if ever he had any (Ford Madox Ford laughed at the idea of Hemingway ever being considered a gentleman). Some have taken this quirk to be a fear of talking away anything he actually had to say in his novels. Others claim that he considered most other topics better suited for conversation as they would help in future writings, future characters. This one’s quite bizarre. Sure enough, I’m happy to admit Hemingway in the league of action men (who wouldn’t?) but standing even while writing seems to be absurd, if only a little. Functionally, it might help one acknowledge what one does as work more “honestly” than a lounging scribbler might. Not only this, but he stands in his loafers before the desk, apparently a habit from the very beginning of his career. 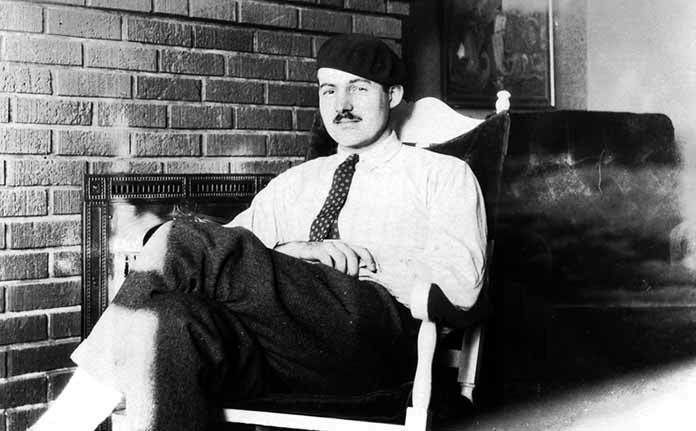 The erect body could function as a better antenna to the radio signals emitted by the muses and graces though Hemingway is not likely to have seen it that way. Supposedly a given, yet it’s worth being reminded constantly. To enjoy the lifestyle of a writer is certainly not to enjoy the writing process. You must feel to be married and devoted to sentences while having an affair with clauses. Love ballads ought to remind you of language, not necessarily of the delightful strumpet of yesternight. 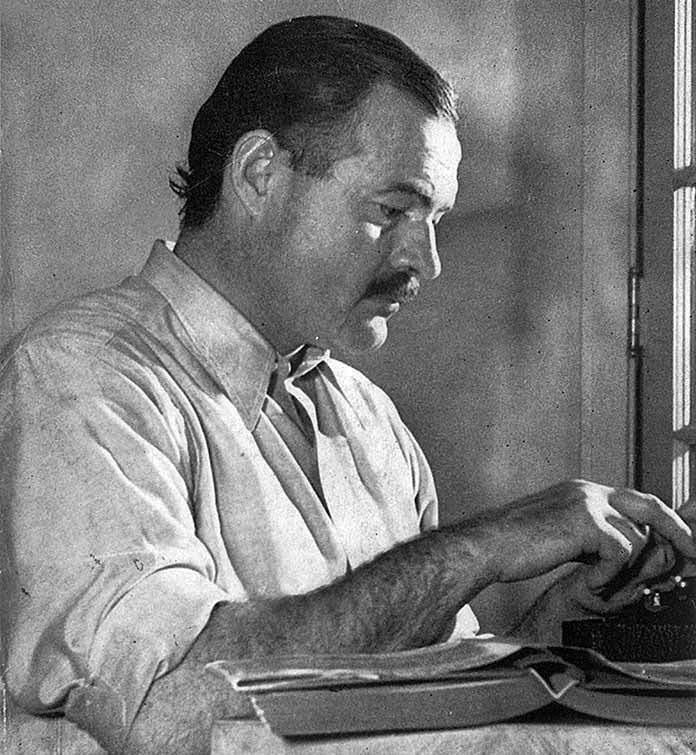 At the end of each day’s writing, Hemingway always went over his work — at this point, it was too soon to judge the merit of one’s own work — in order to count the number of words he had written in those hours. These, he keeps track of on a board entitled “So as not to kid myself” that remains attached to the wall and in plain sight. George Plimpton of The Paris Review records these figures when visiting the writer for an interview: 450, 575, 462, 1250, and 512. This is invaluable when one’s business is as abstract as writing can be; don’t kid yourself!